An optician for more than 20 years, the Dr. Sam team always feels lucky to have Vicky onboard. She fell in love with optometry after working with a friend in an eye doctor’s office and the rest is history. 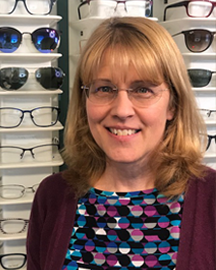 From working with folks to get just the right glasses to working with our staff, Vicky finds it all fulfilling. Outside of work, Vicky is a tough woman to keep still. She likes bowling with her son, hiking with her dog, digging in the garden, cooking, and hanging out with family and friends. She reads almost any non-fiction she can get her hands on, and enjoys wildlife, the ocean and good music. She knows that the most important thing in her life is for family to be happy and healthy. Oh, and her favorite color is (we are not making this up) green.